Update: Sony officially announced that the Lollipop update for both the Xperia Z3 and the Xperia Z3 Compact is indeed rolling out as we speak. While Samsung, HTC, and LG were updating a fair amount of their top-end smartphones with Android 5.0 Lollipop, Sony took its time and did not release a firmware refreshment for its top-end devices. Well, it might be late for the Lollipop party, but this doesn't mean that it's not attending at all. In particular, the rollout of Lollipop for the Sony Xperia Z3 (D6603) flagship has just begun in certain regions. As XperiaBlog puts it, users in Northern Europe should expect the update is about to arrive anytime now, hinting us that the update for other regions is imminent. 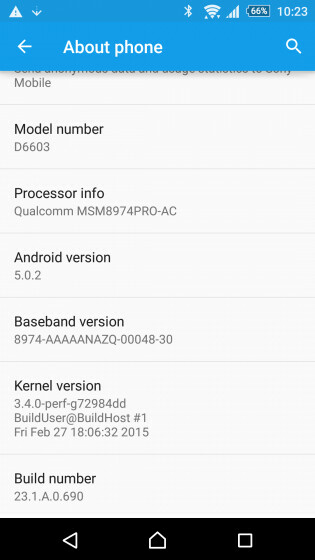 The build in question (23.1.A.0.690) is updating the firmware to Android 5.0.2 Lollipop and the kernel to version 3.4.0. The new, more materialistic interface of Sony's Xperia UI is on board, as well as most of the bells and whistles that the sweet new take on Android brought to the table a few months ago. Check out how the new UI fares against Sony's KitKat one right below. Hopefully this update comes without "memory leak bug" . Well the z3 users waited longer but will get the more stable version. Xperia UI is getting worse and worse (RIP premium UI) !!! I like the new UI. IMO, Its the refreshing new looks that Xperia device needs. But I can understand if you prefer the old one over the new. Unlike Motorola, they put in many unique features and apps that even Google takes inspiration on. There's more to an update than just vanity. Anyone know when south east asia will get it? I am updating my Z3C as we speak here in Sweden. Last as usual. Its great way to keep your existing customers. By providing them the slowest updates.